Obio-Akpor local government Area1 coordinators holds there general meeting yesterday being 13th of Nov., 2016. The meeting which was presided over by the three coordinators who was chooses to super head the Obio-Akpor Area 1 started exactly by 12 noon with an opening prayer by one of the coordinators. After the prayers introduction were being made after which the meeting commenced. A good number of people attended the meeting and the meeting was awesome. The purpose of bringing this meeting down to local governments is to make sure that the meeting is being brought down to the grassroots. Igweocha don't carry last, they want to make sure that this gospel of Chukwu okike Abiama are being preached to the ends of the earth. So for that singular reason, this meeting was established. The three coordinators and the executives of this meeting are those that will represent Area1 In state meeting so that it will not be overcrowded. They are the ones to report to other zonal or unite coordinators what was being said in the state meeting and now these coordinators carry the message down to their own members. The meeting was successful and a lot was discussed for the enhancement of the meeting. 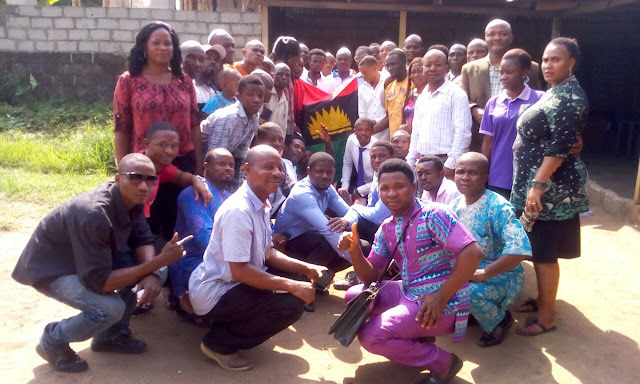 IPOB Igweocha family are not afraid of the zoo government who don't have any other work than to be going from one place to the other looking for where IPOB is hosting they meeting. We are not afraid because IPOB knew that what they are doing is just and right which Chukwu okike Abiama himself is also in heaven presiding over it too. The gospel of Chukwu okike Abiama must be preached to the ends of the world after which Biafra which is the last miracle will come. The meeting was so organized and there are also executive's selected to work with the three coordinators who are the heads of the meeting. Media teams were also selected among the executive's as they are the one to report what was being done in the meeting to the appropriate channel for publication. This meeting has gone a long way in uniting our people and also to make them know exactly which local government each zone or unit fall into. Obio-Akpor local government Area 1 was made up of 15 zones and under these zones there are unites and words. So are other Areas. Now that the meeting is being split like that, nobody will have any course to complain again that they don’t know what is happening as the meeting is now being rotated.